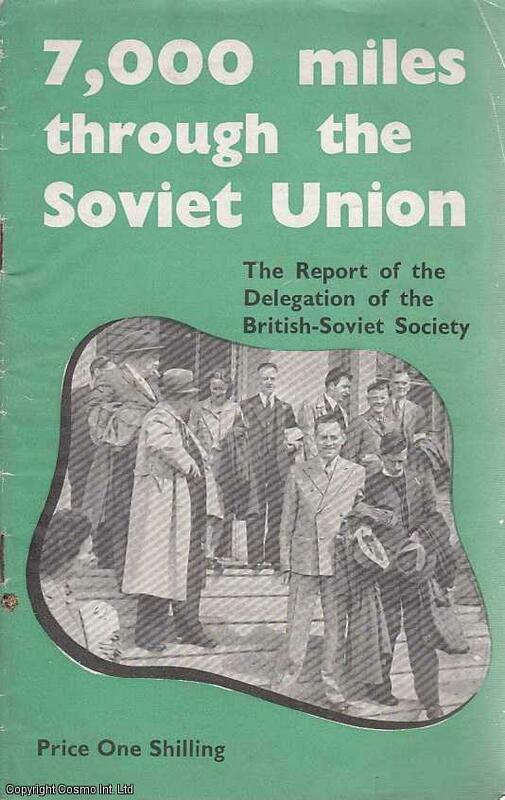 7,000 miles through the Soviet Union, The report of the Delegation of the British-Soviet Society. First Edition, Paperback. Very Good Condition. Octavo. Paper cover. 24 pages with photographic illustrations Quantity Available: 1. Category: Booklets & Pamphlets; Inventory No: 020794. 11th World Festival of Youth and Students Havana Cuba 1978. Communist Party of Havana. 1976. 1976. First Edition, Paperback. Very Good Condition. Booklet. 38 Pages. Paper Covers. Quantity Available: 1. Category: Booklets & Pamphlets; Inventory No: 165838. 18th Congress, April, 1958. Australia's Path to Socialism. Programme of the Communist Party of Australia. Current Book Distributors, Sydney. May, 1958. 1958. First Edition, Paperback. Very Good Condition. Booklet. 24 Pages. Paper Covers. Quantity Available: 1. Category: Booklets & Pamphlets; Inventory No: 165714. Published For The S.N.C.B. 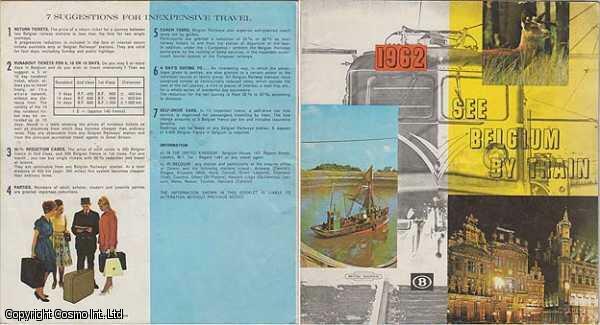 By The Editions Arts & Voyages, Brussels, Brussels, 1962. Paperback. Good Condition. Unpaginated [14 ] pages. S.N.C.B. [SNCB is the National Railway Company of Belgium]. Book - in Good Plus Plus paper covers - light marking to the covers. Contents, clean and tightly bound. Size: 9 inches tall by 8.25 inches. Unpaginated [14 ]. Quantity Available: 1. 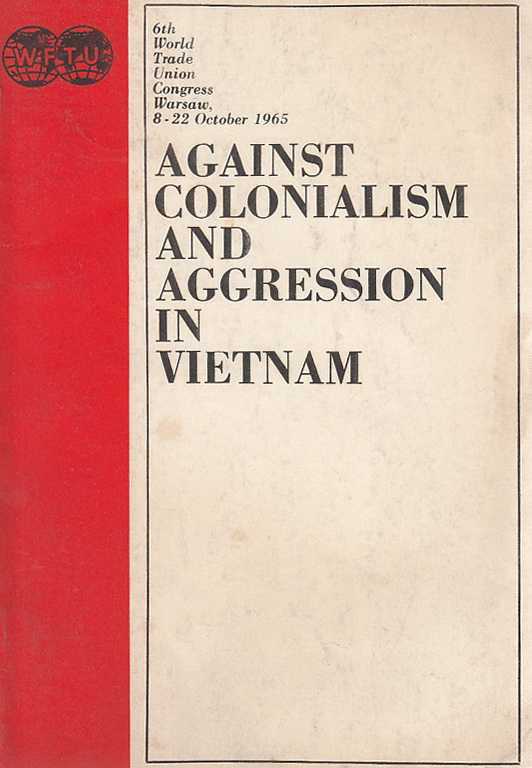 Category: Booklets & Pamphlets; Inventory No: 196820. 1975 Referendum. The Common Market. In or Out. Labour Research Department, London, March 1975. 1975. First Edition, Paperback. Very Good Condition. Pamphlet. 30 pages. Original paper covers, very slightly marked. Near Fine. Quantity Available: 1. Category: Booklets & Pamphlets; Inventory No: 069526. Labour Research Department, London, March 1975. 1975. First Edition, Paperback. Very Good Condition. Pamphlet. 30 pages. Original paper covers, very slightly marked. Near Fine. Quantity Available: 1. Category: Booklets & Pamphlets; Inventory No: 069527. Labour Research Department, London, March 1975. 1975. First Edition, Paperback. Very Good Condition. Pamphlet. 30 pages. Original paper covers, rather marked. Very Good. Quantity Available: 1. Category: Booklets & Pamphlets; Inventory No: 069530. Labour Research Department, London, March 1975. 1975. First Edition, Paperback. Very Good Condition. Pamphlet. 30 pages. Original paper covers, rather marked. Very Good. Quantity Available: 1. Category: Booklets & Pamphlets; Inventory No: 069531. Labour Research Department, London, March 1975. 1975. First Edition, Paperback. Very Good Condition. Pamphlet. 30 pages. Original paper covers, rather marked. Very Good. Quantity Available: 1. Category: Booklets & Pamphlets; Inventory No: 069532. 24th Congress of the CPSU. Information Bulletin 7-8 1971. Peace and Socialism Publishers. Prague.. First Edition, Paperback. Very Good Condition. Booklet. 336 Pages. Paper Covers. Quantity Available: 1. Category: Booklets & Pamphlets; Inventory No: 185376. 25th (Special) Congress of the Communist Party. Draft Revised Text of The British Road to Socialism. The Communist Party 1957. 1957. First Edition, Paperback. Very Good Condition. Booklet. 33 Pages. Paper Covers. Quantity Available: 1. Category: Booklets & Pamphlets; Inventory No: 165431. 36 million Communists say ... Statement and Appeal of the World's Communist Parties, Moscow, Nov. 1960. Communist Party of Great Britain, London 1960. 1960. First Edition, Paperback. Very Good Condition. Booklet. 41 pages. Original card covers, soiled and marked overall. Good. Quantity Available: 1. Category: Booklets & Pamphlets; Inventory No: 069973. 36 Miliion Communist Say... Statement and Appeal of the World's Communist Parties. Moscow 1960. Farleigh Press. 1960. 1960. First Edition, Paperback. Very Good Condition. Booklet. 40 Pages. Paper Covers. Quantity Available: 1. Category: Booklets & Pamphlets; Inventory No: 165195. Address of te Central Committee of the Bulgarian Communist Party to the Members and the Bulgarian People. The Press Department Ministry of Foreign Affairs. Sofia 1949. 1949. First Edition, Paperback. Very Good Condition. Booklet. 7 Pages. Paper Covers. Quantity Available: 1. Category: Booklets & Pamphlets; Inventory No: 165720. Advance Along the Road opened up by the October Socialist Revolution. In commemoration of the 50th anniversary of the Great October Socialist Revolution. Foreign Languages Press, Peking 1967. 1963. First Edition, Paperback. Very Good Condition. Pamphlet. 27 pages. Original card covers. Slight foxing to covers. Very Good. Quantity Available: 1. Category: Booklets & Pamphlets; Inventory No: 065571. Aerospace... Why Nationalise. The Society of British Aerospace Companies replies to the statement of intent of the Labour Party to nationalise Britain's Aircraft Industry. The Society of British Aerospace. 1974. 1974. First Edition, Paperback. Very Good Condition. Booklet. 11 Pages. Paper Covers. Quantity Available: 1. Category: Booklets & Pamphlets; Inventory No: 165743. Again !! The Voice of the People. Further extracts from France's uncensored press. Volontaire, London December 1942. 1942. First Edition, Paperback. Very Good Condition. Contains information on the French Resistance, translations of notes, articles and pieces which have appeared in the French Resistance press since the Allied landings in North Africa, and a note on the labour situation in France. Quarto. (8.5 x 11 inches). 24pp. Original printed coloured paper wraps. Creased, but sound. A good copy. Quantity Available: 1. Category: Booklets & Pamphlets; Inventory No: 176278. 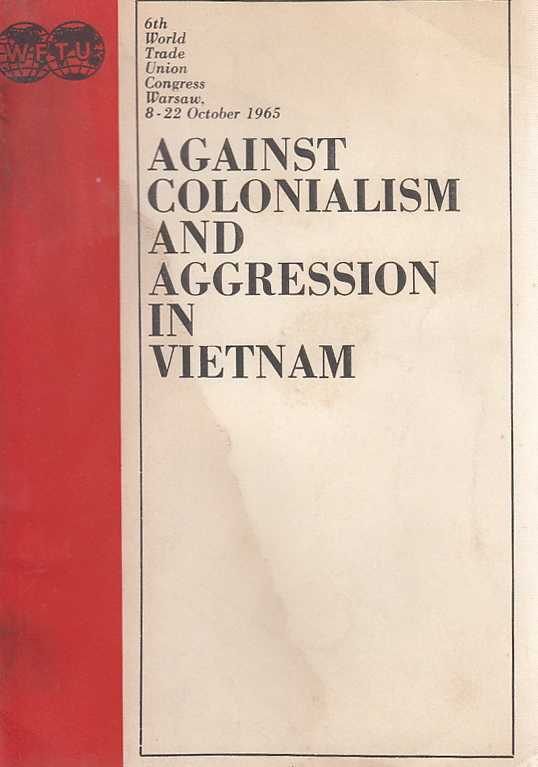 Against Colonialism and Aggression in Vietnam. 6th World Trade union Congress, Warsaw, Oct. 1965. W.F.T.U. Publications, 1965. First Edition, Paperback. Very Good Condition. Booklet. 96 pages, photo illus. Browning throughout. Card covers. Good. Quantity Available: 1. Category: Booklets & Pamphlets; Inventory No: 112441. W.F.T.U. Publications, 1965. First Edition, Paperback. Very Good Condition. Booklet. 96 pages, photo illus. Browning throughout. Card covers marked. Good. Quantity Available: 1. Category: Booklets & Pamphlets; Inventory No: 112476. The Agrarian Reform Law of the People's Republic of China. And other relevant documents. Foreign Languages Press, Peking, 1953, 4th edition. 1953. First Edition, Paperback. Very Good Condition. Pamphlet. 85 pages, some textual underlining. Original paper covers, rather dusty, with top right hand corner clipped. Very good. Quantity Available: 1. Category: Booklets & Pamphlets; Inventory No: 113245. Foreign Languages Press, Peking, 1953, 4th edition. 1953. First Edition, Paperback. Very Good Condition. Pamphlet. 85 pages. Original paper covers, slightly dusty, with top right hand corner clipped. Very good. Quantity Available: 1. Category: Booklets & Pamphlets; Inventory No: 113246. Agreement on Diplomatic Relations between Finland and GDR Initialed. GDR, 1972. 1972. First Edition, Paperback. Very Good Condition. Booklet. 8 pages. Original card covers, very slightly marked overall. Very Good. Quantity Available: 1. Category: Booklets & Pamphlets; Inventory No: 113083. GDR, 1972. 1972. First Edition, Paperback. Very Good Condition. Booklet. 8 pages. Original card covers, very slightly marked overall. Very Good. Quantity Available: 1. Category: Booklets & Pamphlets; Inventory No: 113084. Agreement...for the Establishment of an International Authority for the Ruhr [with Annex], London, 28th April, 1949.Treaty Series No.28(1948). H.M.S.O. London, 1949. 1949. First Edition, Paperback. Very Good Condition. Pamphlet. Anglo French text. 27pages, slightly browned around edges, and library stamp at foot of front cover. Top corner of cover slightly creased and spotted. Very good. Quantity Available: 1. Category: Booklets & Pamphlets; Inventory No: 113129. The Agricultural Policy of the European Community. [Trade Union Series]. H.M.S.O. London, 1976. 1976. First Edition, Paperback. Very Good Condition. Large Pamphlet. 37 pages, textual tables, figures, etc. Original paper covers, rather soiled overall, with corners slightly creased. Very Good. Quantity Available: 1. Category: Booklets & Pamphlets; Inventory No: 069561.